In 1979, W. Robert Revelette graduated from Hanover College in Hanover, Indiana, with a degree in biology. He then attended Miami University in Oxford, Ohio, where he obtained both his Masters and PhD from the Department of Zoology. After completing his doctorate in 1983, W. Robert Revelette did a postdoctoral fellowship at the University of Kentucky in the Department of Physiology and Biophysics where he remains an adjunct associate professor. In 1990, he entered the University of Kentucky College of Medicine and from 1994 to 1997 did his residency at the University of Kentucky in the Department of Pediatrics. 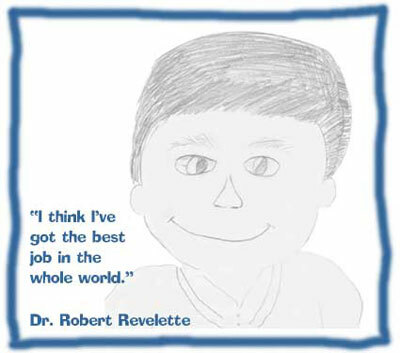 Upon completion of his residency, Dr. Revelette joined Pediatric and Adolescent Associates as a general pediatric practitioner. Dr. Revelette is board certified through the American Academy of Pediatrics and is also certified as a Fellow. He is the past President of the Kentucky Chapter of the American Academy of Pediatrics. He also is a volunteer at Baby Health Service since 1994. For expecting mothers -- rest! For expecting fathers-- follow orders and be supportive! Soak it up! The time will pass too quickly. You and your child will get through it. Try to remember how you felt when you were a teenager. Kids and parents make mistakes!